I recently encountered a malware sample that when sandboxed, exhibited a great deal of DDoS-like activity toward a large number of URLs. When I looked at the network traffic a bit more closely, it reminded me of the Dirt Jumper DDoS bot that I read about in an excellent blog post by Curt Wilson of Arbor Networks. 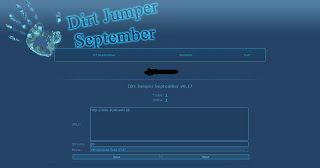 This particular version of Dirt Jumper is attacking a variety of organizations and companies in many different countries. The MD5 of this sample is f29b1089b3f5e076d4d4bd2a3a02d3cb using the domain 'asdaddddaaaa.com' for its Command and Control (C&C). 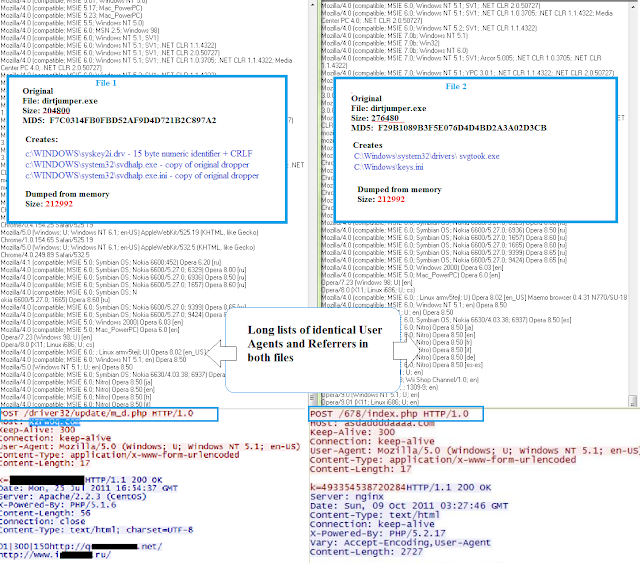 Searching for a similar network traffic pattern yielded a number of sandbox analysis pages containing several more C&C servers and DDoS victims. This research also highlighted a lack of proper detection of this bot variant. Many antivirus companies change the name of this bot across variants, detecting it as zbot, pinkslipbot, Kryptic and others. Microsoft at least consistently detects Dirt Jumper as Dishigy.B, (Dishigy.A is a non-related keylogger with binary in the same directory) and this allowed us to find more examples and prompted further research. Dirt Jumper is proving to be as popular as Darkness/Optima bot we described earlier this year and is gaining more buyers in underground market due to easy implementation and powerful attack methods. There are two ways that Dirt Jumper gets installed on a system - one, as a service, and two, by adding the malicious binary name to the "shell=" line in the registry under HKEY_LOCAL_MACHINE\Software\Microsoft\Windows NT\current version\Winlogon. Installation as a service is more common and this is the default method for versions 1-3 and v. September 2011. 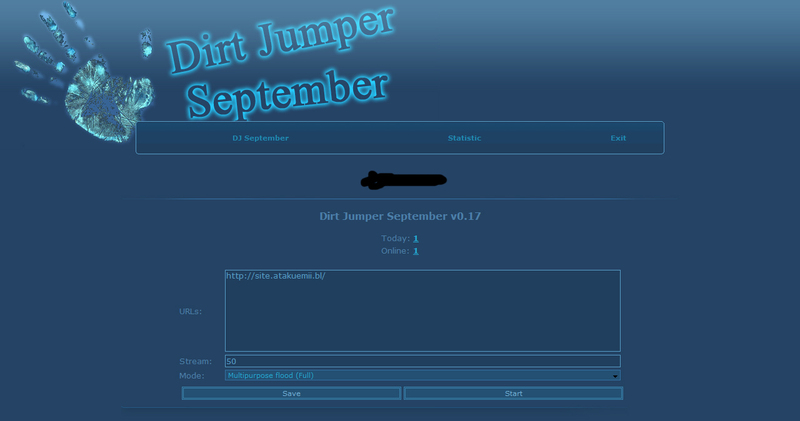 There are some private and custom versions of Dirt Jumper using the Explorer shell method. As can be seen below, the two binaries show slight modifications of the same bot. The current IDS signatures for Dirt Jumper can be modified to match this additional version - The bot ID seems to be the current most common denominator, while C&C URLs and bot commands somewhat vary. I've now routinely adopted the use of Volatility as a key tool in any malware analysis that I do. 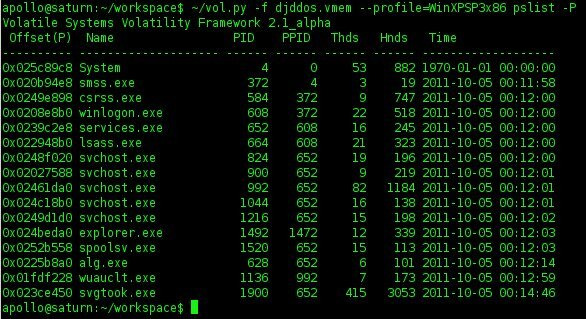 Volatility is described as "a completely open collection of tools.....for the extraction of digital artifacts from volatile memory (RAM) samples". Volatility's ease of use, especially in obtaining basic forensic information that may shed a quick light on the analyzed specimen, makes it an indispensible tool. Version 2.1Alpha was recently released, so I used this to analyze Dirt Jumper binary f29b1089b3f5e076d4d4bd2a3a02d3cb. I executed the malware in my sandbox lab under VMWare Version 7. One of the things I like about VMWare is that you can easily obtain a memory snapshot by suspending the virtual machine, and copying the .vmem file to your analysis directory. That .vmem file is an exact representation of the virtual machine's memory image. If you are not using VMWare, you can also easily snap memory via the MoonSols Windows Memory Toolkit. The first step in any analysis using Volatility is to get information about the image. This is done via the 'imageinfo' command as seen below. Notice that the suggested profile is "WinXPSP3x86". We will specify this profile for all subsequent Volatility usage by using the '--profile=' option when invoking Volatility..
Now we wish to list all the active processes. This is done with the "pslist" command. Note the use of the "-P" switch to tell Volatility to display the physical memory offset rather than the virtual offset. The timestamp indicates the date/time that the process started. Note that all the processes except for 'svgtook.exe' started within a few seconds of 00:12. 'svgtook.exe' has a Process ID (PID) of 1900 and began at 10/05/2011 at 00:14. It should also be noted that in this sandbox run, I initiated the malware execution immediately after booting. Note also that there is no browser process or anything else that should initiate an Internet connection. I next run the Volatility 'connections' command to see all the active network connections. 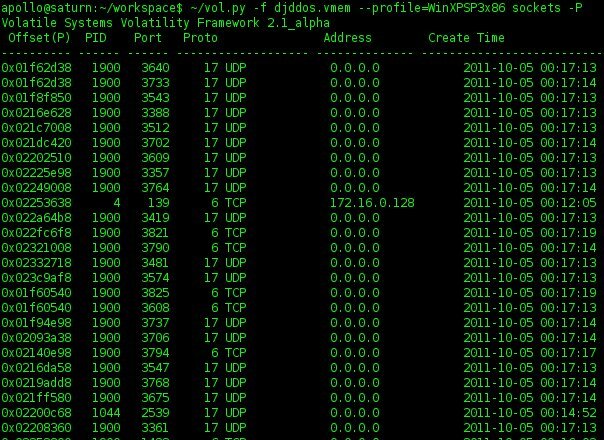 Note that the large number of remote address connections are all associated with PID 1900. The Volatility 'sockets' command will display the listening sockets for any protocol. In the figure below, we see many open sockets for both the UDP and TCP protocol. With one exception, all of these processes are again associated with Process ID 1900, 'svgtook.exe'. By virtue of its many open sockets and dozens of outbound connections, Process ID 1900 certainly seems worth a closer look. By the way, a great new feature of Volatility 2.0 is the 'netscan' plugin. This plugin will scan for network connection artifacts in Windows Vista, Windows 2008 Server and Windows 7 memory artifacts. From the Volatility wiki, "To scan for network artifacts in Windows Vista, Windows 2008 Server and Windows 7 memory dumps, use the netscan command. This finds TCP endpoints, TCP listeners, UDP endpoints, and UDP listeners. 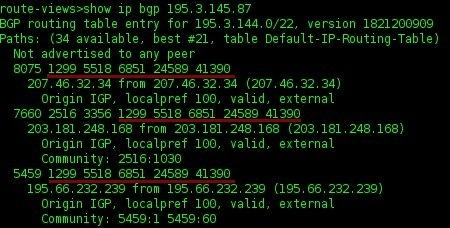 It distinguishes between IPv4 and IPv6, prints the local and remote IP (if applicable), the local and remote port (if applicable), the time when the socket was bound or when the connection was established, and the current state (for TCP connections only)." Since I ran this analysis on a Windows XP system, I'm not able to show you a 'netscan' output for this particular instance. In a follow-up analysis, I'll utilize Volatility under Windows 7. To look more closely at Process 1900, we can dump the process from physical memory. This allows us to examine the process in its executing context as opposed to a packed and possibly obfuscated state. One typical analysis step is to dump the process and use the 'strings' command to look for items of interest. Let's see the result of performing this against our Process 1900. 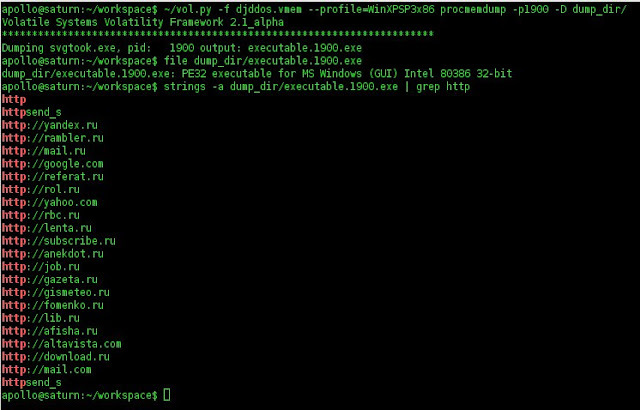 Using the Volatility command 'procmemdump', the 'svgtook.exe' process (PID 1900) is dumped to the specified directory. The following image shows this command being run, followed by running strings against the dumped file, and using 'grep' to search for the string "http". 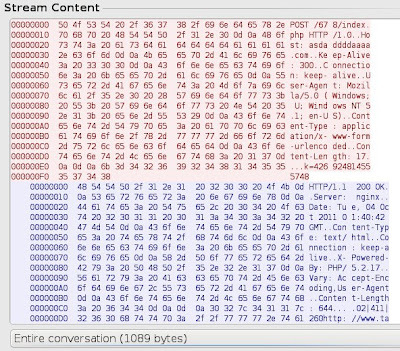 The results show various strings containing "http" being discovered in the dumped file. These include various legitimate sites, as well as the string 'httpsend_s". One of the best ways to discover evidence pertaining to a suspicious process is to dump the Virtual Address Descriptor (VAD) and examine the dumped sections with the 'strings' command. By examining the dumped VAD segments, you can get an excellent view of the "live" data associated with the examined process. A good reference for this can be found in the whitepaper, "The VAD tree: A process-eye view of physical memory" by Brendan Dolan-Gavitt. From the whitepaper," The Virtual Address Descriptor tree is used by the Windows memory manager to describe memory ranges used by a process as they are allocated. When a process allocates memory with VirutalAlloc, the memory manager creates an entry in the VAD tree." Since I'm particularly interested in any URLs or network connection remnants associated with Process 1900, I'll use the 'vaddump' command to dump the VAD memory segments associated with this process. The result of this command leaves approx 950 files in the dump directory of the VAD segments associated with PID 1900. Running 'strings' and grepping for 'http' yields two segments of interest. 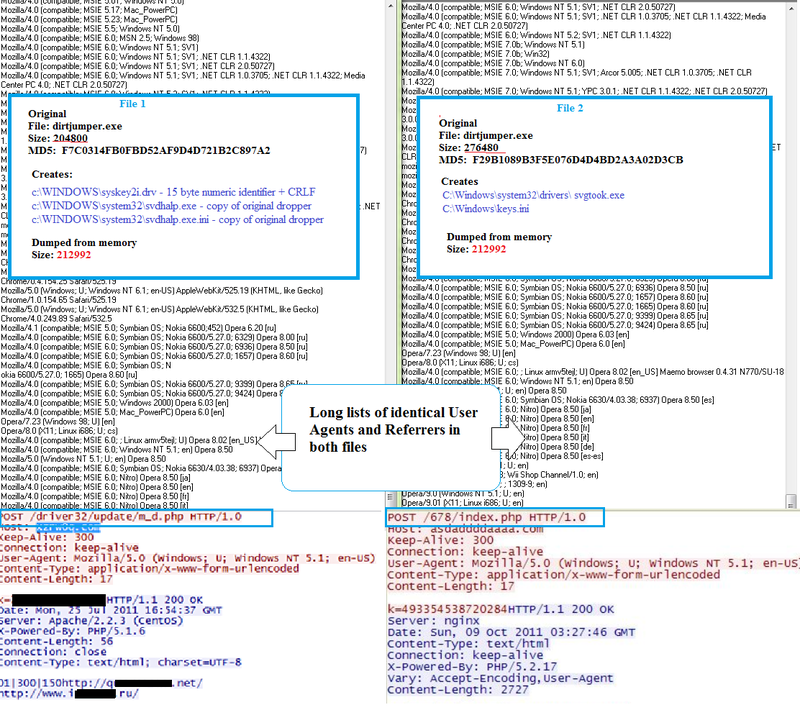 Examining VAD segments for the string "http"
In the image above, we see VAD segment 'svgtook.exe.23ce450.00400000-00dadfff.dmp' reference the same web sites as seen in the dumped process, while 'svgtook.exe.23ce450.01420000-0151ffff.dmp' shows references to various DDoS target URLs received, as well as the C&C "http://asdaddddaaaa.com"
So in this brief analysis, we have been able to utilize Volatility to quickly extract key information about the running Dirt Jumper process. This also equips us to further investigate this process, as well as how other Windows processes may be affected. For example, Volatility allows for extensive registry carving and analysis as well as the use of plugins specifically designed for analyzing malicious code. Upon execution, Dirt Jumper sample f29b1089b3f5e076d4d4bd2a3a02d3cb attempted DNS resolution for the domain, asdaddddaaaa.com. Based on additional research I did, it's very clear that this Dirt Jumper C&C isn't the only malicious activity on Alnet-Latvia. I wonder if the folks at TeliaNet Sweden, or the other upstreams to Alnet-Latvia are aware of this? This would also be a good time to remind hosting providers, ISPs, and network operators to subscribe to the Shadowserver ASN & Netblock Reporting Service. As described in more detail later in this post, we have detected several other C&Cs that appear to be related to the same group operating asdaddddaaaa.com. Several of them continue to actively initiate DDoS attacks. We are currently monitoring these controllers and sharing the victim lists with appropriate law enforcement agencies and the victim organizations. The bot is binary is relatively large, 170-270 kB and is packed with UPX. The bot tasks are not encrypted as you can see in the pcaps and on the C&C server. and referer, receives and sends cookies, builds packages of different lengths, different types of content, changes timeout and sending rate. 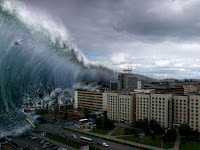 Multipurpose flood (Full) – Same as Multipurpose flood (Light) but POST data is added POST requests will exhaust server resources due to its need to process the data, requiring participation of apache, php, and any linked database. This also helps to avoid Anti-DDoS measures because it imitates random browser requests. POST flood (TimeOut) - Same as above, but it is possible to send data using POST. There is the way to set timeouts for response after sending the data. Access to the admin panel may be limited by IP. Additionally, the first level login page can be accessed only by specifying the correct GET-Passwd. The correct password then allows access to the next level, the regular login page. 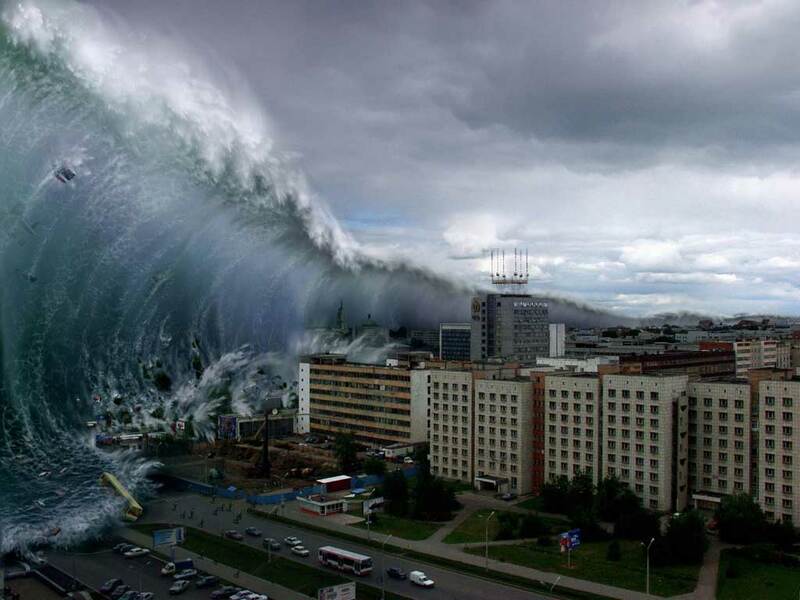 Downloading flood: The bots download files from the website causing bandwidth saturation. Other features are the same as you see above in Version 3. The results showed similar naming conventions for the bot executable file name that is normally chosen by the botnet owner. This was seen as identical names or often starting with "sv" like in "sviooue.exe" and "svgtook.exe", as well as the GET or POST URLs for the drone. In addition, some C&C servers had a history of being hosted on same IP addresses in the past and being moved simultaneously from one hosting provider to another. Other attribution points included seeing the same email addresses in the domain registration, and similar domain names (e.g.xruw0q.com, zprw6q.com and xzrw0q.com; jfasfasfasfasf.com and asdaddddaaaa.com). The resulting matrix clearly shows that seemingly unrelated C&C servers may be operated by the same actors.